At Precision NAPA Autopro in Calgary we offer a wide variety of professional auto repair services. Our experienced auto technicians have the know-how to fix a wide range of vehicle issues such as wheel alignment, brake repair, steering/suspension, transmission service, engine repair, emergency repairs, most any fix your vehicle may need. On top of all our auto repair services we also offer vehicle maintenance services such as oil changes, vehicle fluid services and transmission services. Our auto repair shop in Calgary is built around providing honest, quality service that will maximize the life of your vehicle. We are a full service auto maintenance and repair shop and we approach every vehicle repair with integrity and expertise. We pride ourselves on being able to handle a wide range of auto repair services so we can assure that your vehicle can be completely repaired in just one visit. We work with you to have your vehicle repaired in a timeline that accommodates your schedule. We are always honest and upfront about the repairs your vehicle requires and we will never surprise you with unplanned work. At our auto repair shop in Calgary we know how important having a working vehicle in this city is. That is why we provide quick and quality service to get you back on the road as soon as possible. At Precision Alignment and Brake we want to make sure that your vehicle serves you for many years and this is why we are committed to extending your vehicle’s lifespan. We perform auto repair services that will ensure that your vehicle will be on the road longer. Auto repair services such as wheel alignment, tire rotation, oil changes, fluid service and transmission service will ensure your vehicle is on the road for many more years. If you have been noticing any abnormal sounds or vibrations while driving your vehicle, then bring it into our auto repair shop and let us make sure your vehicle continues running smoothly for many more kilometers! Our auto repair shop in Calgary is committed to delivering the highest quality services at the lowest prices in the city. We feel it is important to provide you with the highest quality technicians and equipment available, but we believe we offer the best prices for high quality work. We will always ensure that we will return your vehicle repaired to the highest of standards with the lowest cost that can be provided. At Precision Alignment and Brake we know you cannot go without a vehicle and we strive to provide prices that will work for you. At Precision Alignment and Brake in Calgary we provide a wide variety of quality auto repair services. If you are interested in our repair services or need your vehicle repaired immediately then please call us at 403-293-3483. Our experienced and professional auto repair technicians are available to repair any issue you may be having with your vehicle. If you have a question for our auto repair experts in Calgary why not try and see if we answer your question below. If you don’t find the answer to your question here please contact us at (587) 317-1559 and we would be happy to help. A wheel alignment is usually recommended when you get new tires — to make sure you don’t wear out those expensive tires prematurely. There are three key indicators to help you identify if your vehicle requires a wheel alignment. The first and most obvious is if your steering is pulling either to the right or to the left, or your steering wheel is off centre when driving straight. There is a fine line between a steering pull and a drift, so they best way to test this is by going to a flat parking lot. If you let go of your steering wheel while driving on a flat surface and your vehicle pulls either to the left or right then your vehicle will require a wheel alignment. Another way to identify if your vehicle requires a wheel alignment is if your tires are wearing unevenly. To check your tires crank the steering wheel all the way to one side so you can easily view the tread face of the front tires. Be sure to look at the INSIDE of the tread. If the driver side tire is more worn than the passenger side or vice versa, then it is likely your vehicle requires a wheel alignment. The final way of identifying if your vehicle requires a wheel alignment is the age of your vehicle. If you have an older vehicle and have never had a wheel alignment done then it is probably a good idea. We can provide an inspection for older vehicles to identify any maintenance it may require, including a wheel alignment. A wheel alignment is an adjustment to a vehicle’s steering and suspension. When a proper alignment is completed on your vehicle, the angle of its tires will be adjusted so all of them make proper contact with the road while the steering wheel is centered. A wheel alignment will ensure the best possible tire wear, and it may correct steering pull. We can identify if there are other factors causing pull that the alignment cannot correct (for example bent suspension parts from an impact, tires that have separated belts, or low tire pressure on one side). The majority of vehicle alignments cost $115 + tax, but it is dependent upon the number of adjustments and type of adjustment points the vehicle has. For example lowered vehicles with adjustable camber plates or arms take extra time, so are more costly. Oil changes vary greatly from vehicle to vehicle – a basic oil change with regular (non-synthetic) oil and filter starts around $60 + tax. Variables include the amount of oil the vehicle requires, as well as the type of oil filter, and so on. Synthetic oil changes start at approx $80 + tax. Many new model vehicles now come with an oil life monitor in the vehicle’s information display. However the oil life monitor is not always correct; they use algorithms to estimate when an oil change is due. Most of the time, these formulas are based solely on mileage, and don’t take into account oil level or condition, so they can be very misleading. Many older model vehicles don’t even come equipped with oil life monitors, so how are you supposed to accurately know when your vehicle requires an oil change? The best way to identify if your vehicle requires an oil change is simply by checking it. Pop the hood, pull out the dipstick and take a look for yourself. If the oil is anything but a honey or amber colour, or the level is below the full mark on the dipstick, you’re due for an oil change. It is also critical to keep track of the mileage since your last oil change service – it is recommended to change regular oil every 5000 kms, and synthetic oil should be changed at 8000 kms. Most shops will place a sticker on the inside of the windshield to advise you when the next oil change is due. The cost of an oil change is small compared to the cost to repair damage caused by contaminated oil and/or a plugged oil filter. If you have waited so long for an oil change that a warning light has come on in your dashboard, then you need to have an oil change done immediately. The check engine light, the oil pressure light, and the oil level warning light are all indicators that your vehicle may need an oil change. If you notice any of these warning lights appearing on your dashboard bring your vehicle to us as soon as possible. Another way to identify that your vehicle may require an oil change is if you are hearing strange engine noises. Ticking or knocking noises from your vehicle’s engine may indicate a low oil level or the wrong oil viscosity. If your vehicle has gotten to the point where it is making unusual noises then extensive damage may be happening. 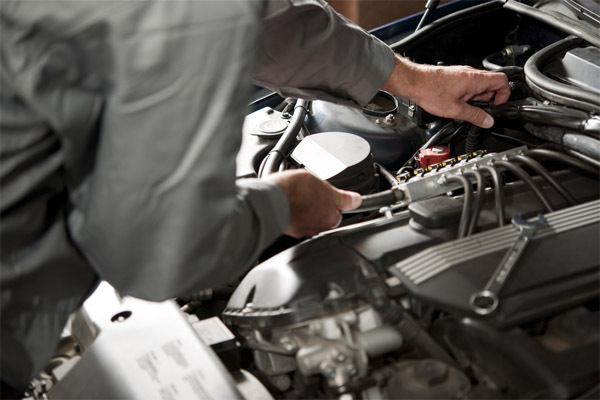 If you have noticed irregular noises coming from your engine bring it to our Calgary auto repair shop immediately. Does my vehicle need an inspection? There are several reasons why your vehicle may need an inspection. The first and most important reason to have your vehicle inspected is if you have noticed any problems when driving your vehicle. This includes issues with performance, strange noises coming from the engine or suspension, your vehicle pulls to one side, or a warning light has lit up on your dashboard. Any of these issues warrants an immediate vehicle inspection to prevent extensive damage being done to your vehicle and prevent costly breakdowns in future. If you are aware of your vehicle’s maintenance requirements, you can plan ahead and set aside necessary funds. Other reasons for a vehicle inspection include: if you are buying or selling a vehicle you may want a pre-purchase inspection, if you are planning on registering a vehicle in Alberta that you have brought in from out of province, or if your insurance company is requiring an inspection. In most cases getting an auto transmission flush done every 80,000 kms or every 3-4 years is enough to protect your vehicle’s transmission. You will want to ensure that if your vehicle has a transmission oil dipstick, the transmission fluid is inspected every time you have an oil change. 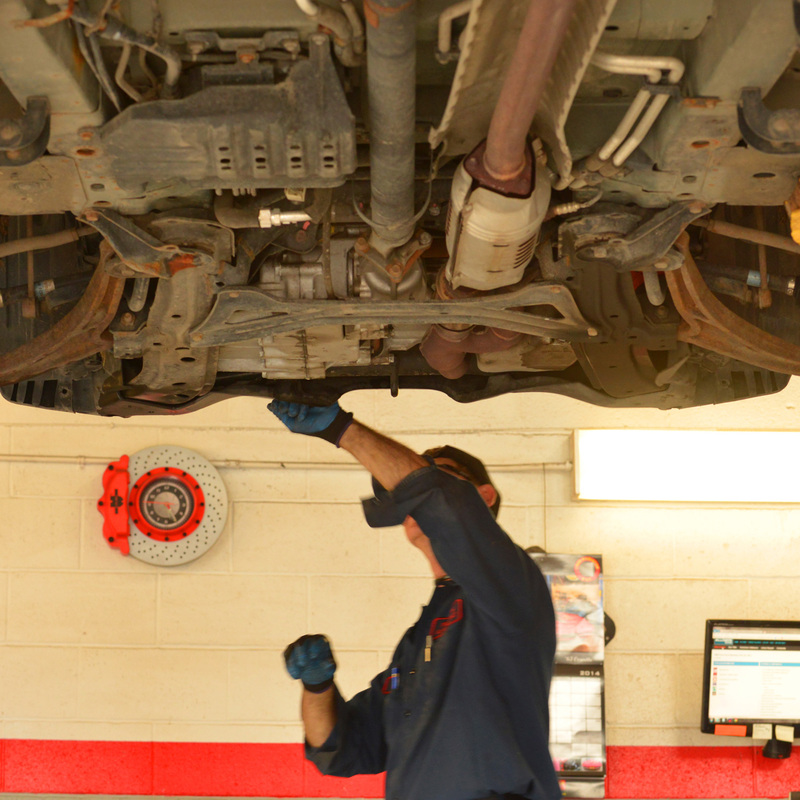 If the fluid is getting dark or smells burnt, that is a good indicator that a transmission service is recommended. If, however, you are concerned about the fluid and your transmission is a ‘sealed unit’ and there is no dipstick, it requires a special procedure to test and replace fluid. Other indicators include if your vehicle is having problems shifting gears, you notice the gears are slipping, unexplained surging of your vehicle, or delays in the vehicle’s movement. If you have encountered any of these problems please bring your vehicle by our Calgary auto repair shop so we can inspect your transmission and perform a transmission flush. In the case of grinding noises or gears slipping, it may be too late for a transmission flush as damage may have already been done. The number one and most important indicator that your vehicle requires new brakes is a squealing noise when braking. The reason you will hear this squealing noise while braking is because the majority of brake pads come with wear indicators. The sole purpose behind these things is to emit an unpleasant screech when your brake pads need to be replaced. Best plan is to arrange for a brake inspection along with your oil change service twice a year so you are aware of the condition of your brakes. Other indicators that you may need new brake pads are if you hear a clicking noise while braking, if bringing your vehicle to a full stop takes longer than it used to, your vehicle pulls to one side while braking, or the brake pedal vibrates when you push down on it. If you are experiencing any of these issues then bring your vehicle into our Calgary auto repair shop and let us replace your brake pads. Contact Us to Setup an Auto Repair Appointment Today! Need shuttle service? We offer a complimentary shuttle service that can take you anywhere within a 10km radius of our shop. We can get you to the nearest c-train station, workplace, home, Starbucks or shopping centre while we service your vehicle. By appointment only.